I've been meaning to blog about this, for what seems like an Eternity, but I've been battling over whether of not to show pictures of my legs. In the end, I decided that the world was not yet ready to see them, neither clean-shaven or not!! Therefore, I'm sorry, but this is not going to be the debut of my pins! Oh, I can hear the world sighing a great sigh of relief as I type that!! Why I bought this product: My Mum bought this for me quite a while back, when it was on offer in Boots (I think it was a new product type of offer, but I can't quite remember). And the reason that I wanted to give it a try, was really because when it comes to shaving my legs, I really really hate it, so having a product that will slow down the growth of the hairs, so I don't have to shave so often? Oh yeah, no that is what I am talking about!! 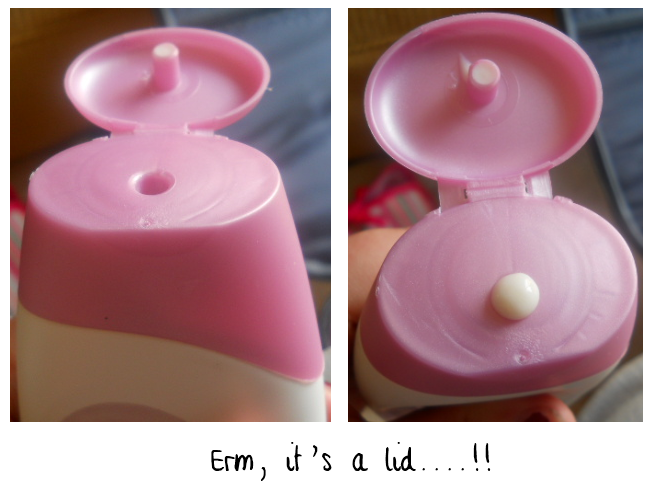 The Product: The product is more of a liquid-based moisturiser, rather than a creamy one, obviously! Not really much more I can say than that!! 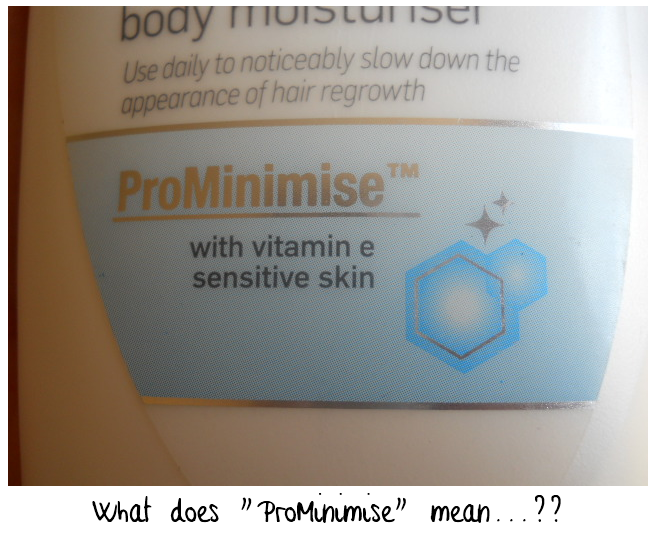 So, what does ProMinimise mean? I am always incredibly dubious of these "trademarked" terms, because I feel like the company is just trying to win us over with fancy terminology, that sounds Scientific, but doesn't really have any grounds for meaning anything at all. I decided to go hunt down the Veet website, to see if they'll actually tell us what "ProMinimise" means, in a more specific sense, but the only thing I could find out, was basically what I've already mentioned, above about it hydrating the skin. But, seriously, is that not what any normal moisturiser does? This is where I thought that it would be a great idea to shave my legs, and moisturise on leg with my Veet Hair Minimising Body Moisturiser, whilst the other one I would moisturise with an ordinary body moisturiser. The idea being to monitor the hair growth, and discover if the product from Veet thins the hairs more than a product not being marketed for this purpose. As you can imagine, this was where the images were supposed to come into play, but unfortunately, I chickened out of putting them up. The Results: I left my legs, without shaving them for two weeks, moisturising them, as mentioned above, each day with different moisturisers (making sure to use the right one on the right leg), and I was actually really impressed to discover that both legs, whilst did have hairs, they were both incredibly light. Much lighter than normal, that's for definite. But, when I asked the other half which leg he thought looked like it had the lightest hairs, he replied that they both looked exactly the same. 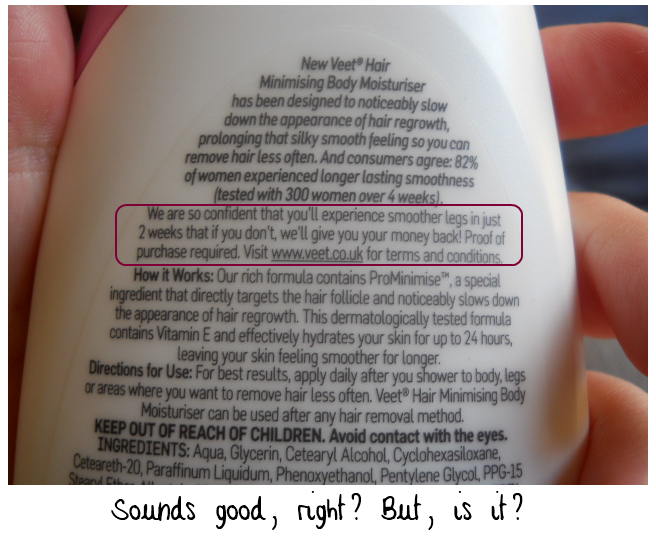 Of course you'll have smoother legs, because that's what any standard moisturiser does to your skin! But, that isn't necessarily down to this product being unique, because any other would do that as well. Forgetting it's real purpose: As a moisturiser, this product smells quite light for a moisturiser, or as the boyfriend said, he thought it smelt like "sun cream". It's not overpowering, which I liked. The only real thing that I don't like, when thinking of this product solely as a moisturiser is that the product is very runny and I found that to be a bit annoying. But, that's probably more to do with the fact that I personally prefer cream-based moisturisers that come in tubs. So, that's more a personal preference than anything. Overall: I am genuinely impressed that the hairs on my legs were lighter, and my legs were smoother. But I was disappointed to discover that I can achieve this with another cheaper brand of ordinary product, just as well. So, it feels like your typical marketing of an age-old product, but in a brand sparkling new way to make it look pretty, sound amazing and encourage shoppers to buy a product that we'll believe to be a new invention, when really there isn't anything new or original about it. Because other than the word "ProMinimise", there isn't really anything, that my untrained eye, can see that makes this any different, unfortunately. Would I Buy it Again? Definitely not. 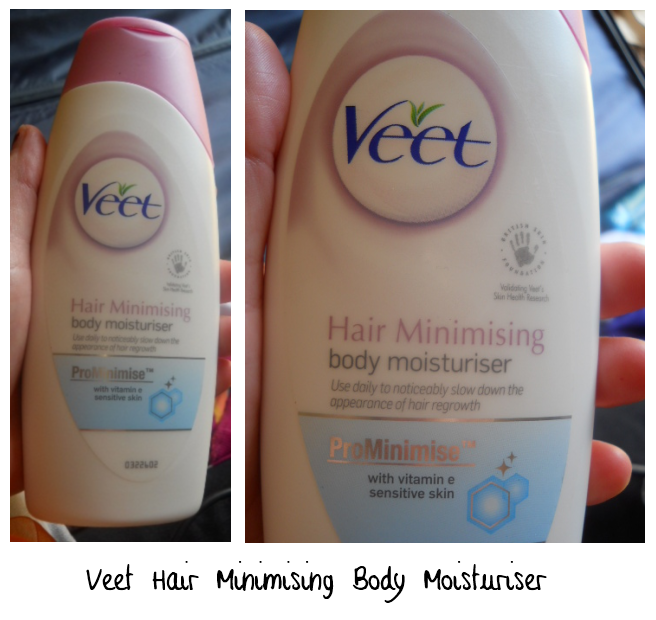 I'll be sticking to an ordinary body moisturiser on an area that I've evidently been neglecting for far too long! Price: I've found this ranging from between £5 - £8. Where to Buy: Any shop that sells skin care products, such as Boots. I have the aloe version, and I guess I should use it more often. Infact moisturise my legs more often full stop. But what I hate about the lid, is that its flat. It's quite a liquidy product, and I find the product just smears itself on the lid and I have to do my best to wipe it off on my leg without squirting more product out. [If any of that makes senese]. Since I stopped using this product, I don't moisturise my legs very often either!! Neglected :) I really hate how liquidy the product is too!